Software / Setup solution for stringing problem? Posted April 7, 2016 · Software / Setup solution for stringing problem? After a few weeks printing my Ultimaker 2 starts stringing independent of what PLA and color I use. Every time the extruder jumps from a finished shape to another I get strings staying outside the object surface. Playing with the retraction values dosnt really help. But I wonder why theres no option to let the extruder drive without extruding a bit after a finished shape BEFORE jumping to the next one. Or at least not jump from the outer skin, if it only start "jumping" to the next shape from the center of some geometry the STIRNG is already lost before leaving the outer skin, so no way to add there this ugly strings I guess. I know driving about already printed geometry can make some bad effect in top surface too, but im not talking about the few top and bottom layers. I hope theres already some ad on, or hidden setup option or another effective solution for this problems. Its no big thing but it just make a lot work to cut the strings away all the time. Posted April 8, 2016 · Software / Setup solution for stringing problem? Interesting idea - trying to get the string to pull off when it passes over the edge. I don't get much stringing. I print a bit slower and cooler. If you print for example at 30mm/sec and 210C you might find you get zero stringing. But maybe you find this to be too slow? Hm, geting a bit cooler is maybe something I have to try with more too. But I don't want to get much slower if possible. Posted April 9, 2016 · Software / Setup solution for stringing problem? If getting slower helps, why not just get for a second slower direct before jumping. I guess theres many ways to fix this stringing problems already on software/cura side? Yes. Well. This is what frustrates me about Marlin. I have been pushing this for a year (not very hard but still). 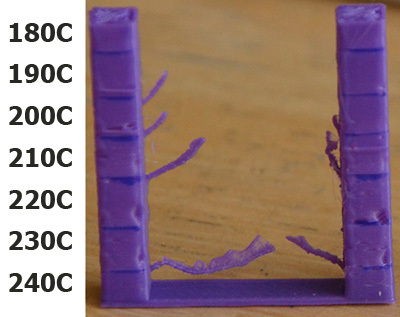 The reason slower helps is because there is less pressure in the bowden and in the nozzle when printing slower. The reason cooler helps is because the filament is more like toothpaste (versus honey) and so it's less likely to leak out but you can get underextrusion if you try to print it too fast. Posted April 18, 2016 · Software / Setup solution for stringing problem? Posted April 20, 2016 · Software / Setup solution for stringing problem? The thinner the strings, the easier they are to remove. Very very thin strings can be removed with a candle flame but be very very careful.